I was recently at Austin for SXSW, and I was able to squeeze in a trip to one record store, Waterloo. I was happy to flip through their used singles, as I found several local Texas private press items, one of them being this record. If a record is self-released (or obviously a small press), at all cool looking, and is cheap I will almost always buy it -- although I do consider how cool looking it is versus how much it costs. An $8 rccord has to look pretty cool for me to buy it if I've never heard of it, but I do very much like to experiment. This record is a little bit country and a little bit rock and roll. How do you like them apples? 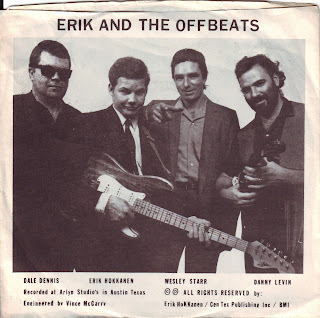 Ladies and gentlemen, for your listening pleasure, Erik And The Offbeats.